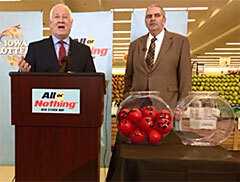 The Iowa and Minnesota lotteries announced a new game today that has different twist on winning the top prize. Iowa Lottery spokesperson, Mary Neubauer, says the new game is called “All or Nothing,” and involves players choosing 12 of 24 numbers. “You can win the game’s top prize of $100,000 dollars by matching all of the winning numbers in one of its drawings, or none of them,” Neubauer says. She says they often hear from players who buy a ticket and don’t match any numbers in a drawing. “We’ve taken what’s really a player complaint about lotto games and we’re using it as a basis for this new game,” Neubauer explains. The game which begins Tuesday, has an hourglass prize structure that offers 10 ways to win, and the all or nothing concept doesn’t just include the top prize. Minnesota and Iowa will both offer the game.”By joining together we can have a bigger population base playing the game and it really just allows us to offer a game that has a bigger prize structure and more opportunities for people to win,” according to Neubauer. This game will have two drawings per day, seven days a week. “Drawings will be held at 12:45 P.M and 8:45 P.M. daily, and you’ll be able to buy tickets for the next drawing until about a half an hour before that,” Neubauer says. Tickets for each drawing will cost one dollar.